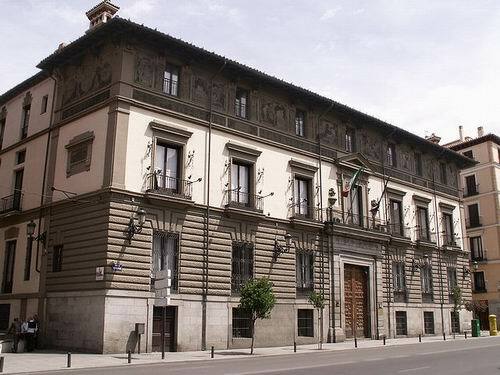 Palacio de Abrantes is located at number 86 Calle Mayor in Madrid, just a few minutes walk from the Cathedral and Royal Palace. Today it is the building that houses the Istituto Italiano di Cultura, or the Italian Cultural Institute. It is named after the Duke of Abrantes who acquired it, and who in 1844 restored the building more or less to its original style. It was designed by architect Juan Maza, who was commissioned by Infante Don Juan de Valencia, and was built between the years of 1653 and 1655. Originally the building was flanked by two towers and was considered to be a most beautiful looking palace. Over the years it changed hands quite a lot. In 1656 it was bought by Antonio Valdes and Ossorio, who a knight of the order of Alcantara. In 1669 the Marquis de Alcañices became the owner, and for most of the 1700s it belonged to the family of Cuevas and Pacheco. In 1842 the Duke of Abrantes became the new owner and commissioned architect Anibal Alvarez Bouquel to remodel the palace. He added mid-nineteenth century aristocratic tastes; the balconies were upgraded and a new front door was added, among other items. The Restoration of Alfonso XII in the latter part of 1874 proved a difficulty for the Duke of Abrantes; his son, Angel Fernandez de Cordoba and Carvajal, Marquis de Sardoal was active against the monarchy, and in an attempt to reduce the possibility of retaliation, the Duke of Abrantes sold the palace. The new owner was Senator Manuel Maria de Santa Ana. He made the palace the headquarters of the capital's newspaper, "The Correspondence of Spain," which was in circulation until 1888. When the newspaper ceased being published, the Italian government who were looking for a suitable building to serve as their embassy, bought it. Under Italian ownership, architect Luis Sanz started new renovation of the building. He removed the flanking towers and had the present day paintings on the top floor frontage done. Its present look is from this time. In 1939 during the Civil War, it was occupied by the Italian battalions of the international brigades. The embassy was moved from Palacio de Abrantes to the palace of the Marquis de Amboage. The Palacio de Abrantes then became the Italian Institute of Culture, which it remains to be. You can visit Palacio de Abrantes in the western part of the city by Metro. While there is no really close Metro station, a few are within walking distance: Opera lies to the northeast, La Latina lies to the southeast, and Tirso de Molina lies a little further away to the southeast.